Many thanks sundial delivered safely and following your instructions installed correctly. Again many thanks for the work, it looks great. We have been lucky to have beautiful weather yesterday and today, just the right conditions to set up our Orbdial. It is superb overlooking the Tees Valley. My parents received the sundial and love it! They are working with their landscape architect to determine the best spot in their garden for it. Would you be able to suggest what the best height for a base is? I just wanted to let you know that the sundial arrived safely a short while ago. I’m delighted with it and I’m sure Iain will be likewise. Thank you for your great service. We have the sundial and column in hand and will arrange installation. Thanks for the superb craftsmanship which will be a feature for many years to come. 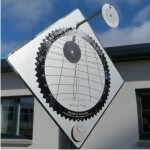 We are delighted with our newly installed Songbird sundial. If this is the first of this type I hope that others will appreciate what a brilliant design it is. Thank you Alastair. It looks superb. Am looking forward to installing it and have found the ideal silver granite plinth for it to stand in our new garden. Sandstone pedestal safely received and erected. Looking good! Many thanks. We’re heading away for a family weekend for my mum’s birthday. I think she’ll really love the sundial. Thanks for your work and getting it ready so quickly. 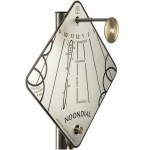 I received my sundial today and it is absolutely gorgeous, thank you very much. I am looking forward to getting it out in the garden and on its stand as soon as I can. The sundial looks fantastic thank you. I have just mounted it in the pouring rain. The column is marble from Verona. It looms yellow in the morning, pink in the evening – when we have some sun! 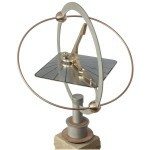 The Orbdial arrived safely in the New Year and is terrific, and has aroused much interest locally. With best wishes and again many thanks for the excellent dialogue and service and all your efforts to get it to us. Thought you might like a snap of the sundial in situ in my mother’s Lanark garden. It was an extremely successful present – thanks again for your help in arranging it. Sorry I have not been in touch sooner – I’ve just never had a minute – but Adrienne loved her Sundial, so thanks for helping me make it a special Xmas for her. 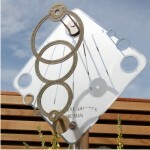 Our friends up in Aberdeenshire are thrilled with the presentation sundial we gave them. They absolutely loved it. I just had to ring you up and say what a success it has been. Inverewe Garden, National Trust for Scotland. The sundial is attracting a lot of interest, and people study and discuss it for a long time. It really is an intriguing sculpture. We are very pleased to have it in our garden. Just to let you know the dial arrived today, it is beautiful! Once again, very many thanks for everything and very best wishes. 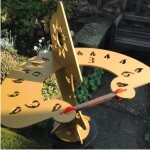 The sundial has already given us a new interest in the garden and has proved to be a great conversation starter. This is the inscription I would like on the sundial. It is a poem from the Sung dynasty. I have had the Noondial installed since the Autumn. I love it. A great conversation piece. Everyone who sees it has asked for an explanation – so it does its job! Thank you again. 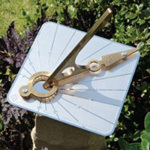 “Macmillan Hunter produces astonishingly beautiful and incredibly accurate sundials.” May 2014. “Macmillan Hunter sundials were on display at both The Chelsea Flower Show and Gardening Scotland, earning Alastair a reputation as one of the UK’s finest sundial makers.” September 2012. I have great pleasure in writing to congratulate you on being awarded Highly Commended in the Professional Class of the British Sundial Society’s Sundial Design Competition 2010. RHS Chelsea Flower Show 2012 Certificate of Commendation awarded to Macmillan Hunter for the high quality presentation of their stand.